Peppermint and chocolate is a wonderful combination, whether you are eating a chocolate-dipped peppermint candy or stirring a candy cane into a mug of hot cocoa. 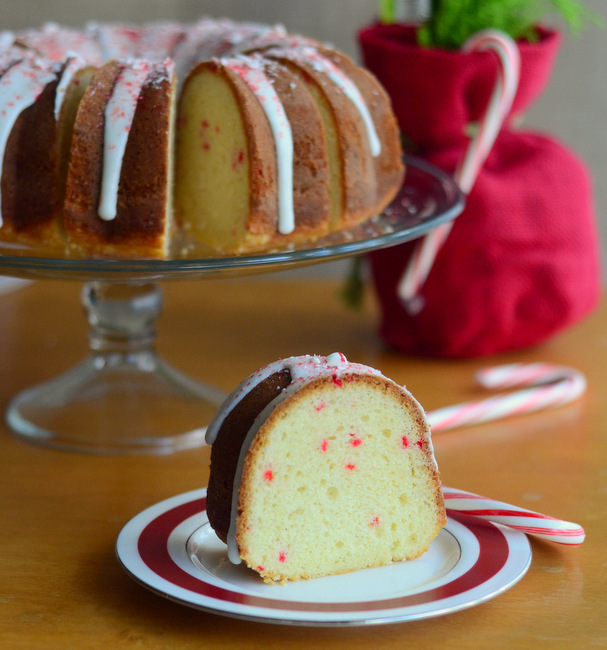 Peppermint doesn’t get paired quite as often with vanilla, but I believe that the two flavors just might be an even better combination – especially when you are combining them in a recipe like this Vanilla Bean Peppermint Bundt Cake. The soft, tender cake is perfect for the holidays, when you want something with lots of seasonal flavor that isn’t so heavy it will prevent you from indulging in other cakes, cookies and candies that might have been set out to snack on. The cake has a tight crumb that is similar to pound cake, though the overall texture of the cake is slightly lighter than that of a traditional pound cake. I used both vanilla bean and vanilla extract in this cake – both from Rodelle – to get the maximum amount of vanilla flavor. The vanilla bean has a sweeter, more exotic aroma to it that does translate well to the cake, but the extract seems to blend perfectly with the other ingredients to create a strong vanilla backdrop. The aromatic vanilla combines with the peppermint for a cake that tastes incredibly light and flavorful. If you look closely at each slice, you’ll see black flecks of vanilla bean. You don’t need to look quite as closely to see colorful flecks of red. I added red jimmies (sprinkles) to the cake to give it a festive look and to hint at the peppermint flavor. Peppermint candies tend to melt when they are incorporated into a cake batter, while jimmies leave behind a little burst of color. Since there is already peppermint extract in the cake, I only needed to enhance the look. This is the same technique used to create festive funfetti cakes, though those use rainbow sprinkles and not just one color. It’s easy to find containers of red jimmies around Christmas and Valentine’s Day, so stock up when they’re in season and keep them on hand! I finished this bundt cake with a peppermint and vanilla glaze, then sprinkled the top with some crushed candy canes for color. The peppermint in the glaze is a big bolder than the mint in the cake, giving the cake a refreshing finish without being overpowering. I made my glaze on the thick side so that it would create neat lines on the cake. Thinning out the glaze with a little more milk will enable you to evenly cover the whole bundt, so feel free to adjust the consistency to get the finished look you like best. Preheat oven to 350F. Grease and flour a 10-inch tube pan. In a large bowl, cream together butter and sugar until light. Beat in the eggs one at a time until well-combined, then add in the vegetable oil. Slice the vanilla bean lengthwise using a sharp knife, then use the back of the knife to scrape out the seeds. Add the seeds to the sugar mixture and mix thoroughly to combine. In a measuring cup or small bowl, combine vanilla extract, peppermint extract and buttermilk. Working in two or three additions, alternately add the flour mixture and the buttermilk mixture to the butter mixture, ending with a final addition of dry ingredients. Stir only until no streaks of flour remain. Fold in red jimmies just until evenly distributed. Pour batter into prepared pan. Bake for 50-55 minutes, until a toothpick inserted into the center comes out clean. Cool on a wire rack before topping with glaze. In a medium bowl, combine sugar, milk, vanilla and peppermint. Whisk until smooth. If mixture is too thick to drizzle easily, add in additional milk 1 teaspoon at a time until desired consistency is reached. Drizzle over cake, then sprinkle cake with crushed peppermint candies while the glaze is still tacky. Allow glaze to set for at least 30 minutes before serving. 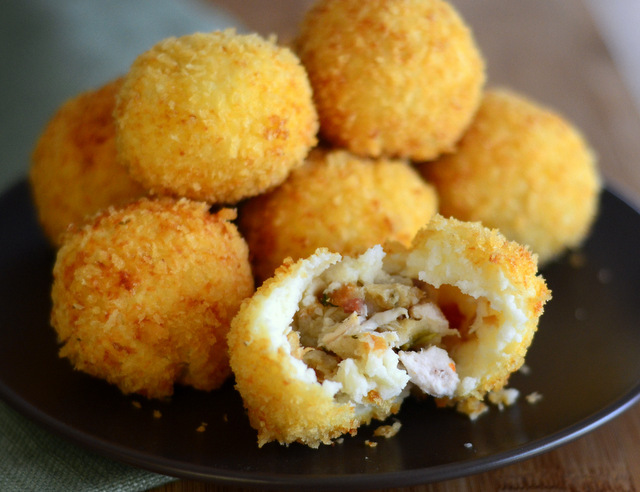 Can You Bake With Eggnog? 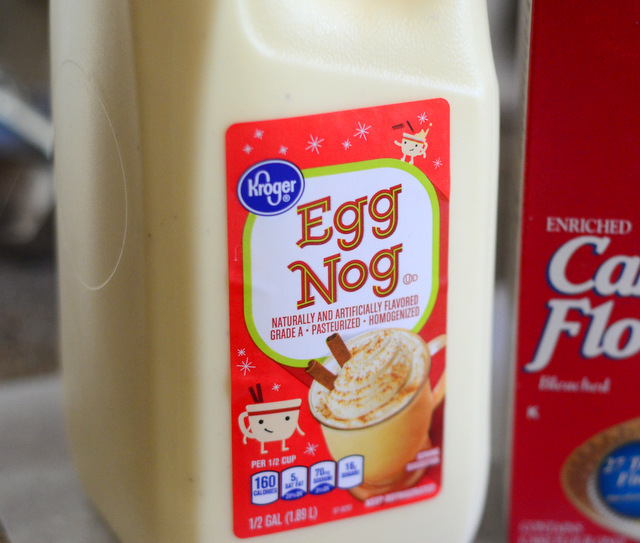 Next PostNext Can You Bake With Eggnog?